MARTIAL LAW. Several members of President Rodrigo Duterte’s Cabinet were activists during the martial law era. 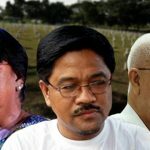 MANILA, Philippines – Allies of President Rodrigo Duterte who themselves were human rights victims during the martial law era are now being challenged to speak up and convince the President to change his mind about the hero’s burial for the late dictator Ferdinand Marcos. “If the President listens to public opinion, he has in his Cabinet victims of martial law… it would be beneficial to hear their voices to encourage the President [to change his decision],” Ifugao Representative Teddy Baguilat Jr said in Filipino on Tuesday, August 9. 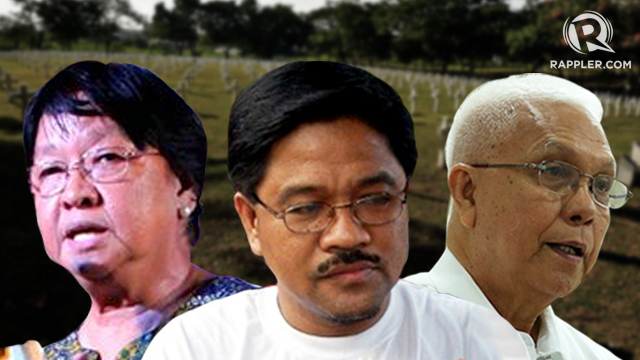 The Liberal Party (LP) lawmaker is among the politicians involved in a multi-sectoral coalition against Marcos’ planned burial at the Libingan ng mga Bayani (Heroes’ Cemetery). Baguilat was referring to Social Welfare Secretary Judy Taguiwalo, Agrarian Reform Secretary Rafael Mariano, and Cabinet Secretary Leoncio “Jun” Evasco Jr. He also named singer-composer Freddie Aguilar, who was earlier rumored to be up for the leadership of the National Commission for Culture and the Arts (NCCA). Taguiwalo, Mariano, and Evasco were members of Left-leaning movements while Aguilar’s song “Bayan Ko” had been the anthem of the opposition against the Marcos regime. Staunch Duterte allies Senate President Aquilino Pimentel III and Senator Alan Peter Cayetano earlier expressed their disapproval of the President’s decision to allow the burial, saying they do not consider Marcos a hero. Baguilat said statements like these are much needed from Duterte’s allies so the President won’t dismiss the calls as just “noise” coming from the opposition. Another point Baguilat raised: What would communists have to say about the hero’s burial for Marcos? When Marcos declared martial law in 1972, he had cited a communist threat to national security. “I hope they make it one of the preconditions to pursue the peace talks. At least to say something about the Marcos burial,” Baguilat said in Filipino. Communist Party of the Philippines (CPP) founder Jose Maria Sison earlier said that Marcos’ burial at the Libingan ng mga Bayani is a non-issue for him.